Bowling Green State University, Bowen-Thompson Student Union, Room 201 (Sky Bank Room). Speaking to numerous detectives and future graduates of Criminal Justice programs this month will hit home a little more than usual. This November 21st it will be forty-two years since my sister Kathy was murdered. No one has ever been charged for this brutal crime. This month I honor her by searching for the truth and not being afraid to write about it. Also by speaking to detectives encouraging them to press on with unsolved murder investigations. As they see Kathy’s face in my PowerPoint presentation I hope she will inspire them to never give up on those crying out for justice. Good luck on your presentation. I am praying someone there will finally do something to solve this crime. Thank you Betty, I appreciate your prayers. I found this blog as I was reading about, and researching, a missing girl from Brockton, mass. Her name is Jennifer Fay. My heart was touched when I read about her family and how absolutely devastating this journey has been for them. I admire their courage. I admire your courage for keeping a blog about your sister. How devastating for you to have lived through this nightmare. I am so sorry. I’m glad you stumbled upon my blog. 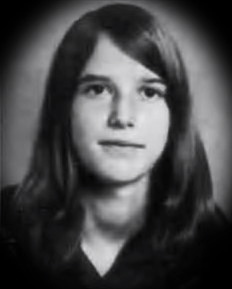 My goal in life is to honor Kathy by educating detectives and the public on the destruction caused by murders whether solved or unsolved. So many left behind never accept living with such a tragedy. The overwhelming grief remains with them always. I still have difficult days but have learned to work through it and use what happened to her to make changes for others. She was a beautiful girl, the world missed out on knowing her. I attended the speaking engagement at the BCI region of Toledo at Bowling Green University this past Tuesday.. Karen, you really have an important message. As i looked around the room at the detectives and the attendees, I could see how engaged they were and how it affected them after the training session. Several of them came up to me and said that they could NOT do what you did. Then I witnessed them honoring you with a plaque and an Appreciation Certificate from the Attorney General’s office. Everyone applauded and several people gave you hugs. It was endearing and I was very proud of you. Keep up the good work Karen and I’m glad you found something so important and that it has enriched your life. Thank you Mike, your words mean a great deal to me. I’m glad that you were able to attend and see it all. You support me in so many ways. The endeavor to educate and make changes requires encouragement from family and friends. It was a special day with the BCI, I’m thankful.